THIS IS IT: 2016 marks the last time BLACK SABBATH will be on tour, and likely the last time the band will be fully active in its current incarnation. So there’s no better time for the legendary band’s entire history to be fully documented with the new book The Complete History Of BLACK SABBATH: What Evil Lurks by music journalist and author Joel McIver (published October 15, 2016, Race Point Publishing). 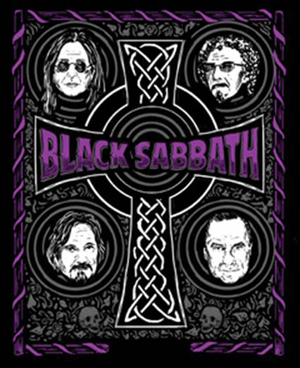 Formed in Birmingham, UK in 1968, guitarist Tony Iommi, bassist Geezer Butler, drummer Bill Ward, and singer Ozzy Osbourne, author Joel McIver explores the complete history of SABBATH from the band's early years experimenting with new sounds and laying the groundwork for an entirely new music genre, to Ozzy's dismissal in 1979 after years battling alcohol and drug abuse. The Complete History Of Black Sabbath also covers in-depth the years with Ronnie James Dio, the myriad of line-up changes after Dio’s departure, Ozzy's re-entry into the band in the 90s, through their last tour in 2016. The Complete History Of Black Sabbath: What Evil Lurks also features a foreword by Robb Flynn of MACHINE HEAD, as well as a four-page gate-fold family tree that documents each member’s path to BLACK SABBATH and their various side and solo projects and bands. There’s nearly 200 images in all, including photos from this year’s tour as well as a complete discography,. The book is a must-have for both the life-long BLACK SABBATH and newcomers to the legendary band. About the Author: Joel McIver is the bestselling author of Justice for All: The Truth About METALLICA which has been translated into 9 languages. He has written for Rolling Stone, The Guardian, Metal Hammer, Classic Rock, and he is the occasional guest on BBC. He is currently the editor of Bass Guitar magazine. Classic Rock magazine has called him "by some distance Britain's most prolific hard rock/metal author." He wrote the official biography of the world's biggest death metal band, CANNIBAL CORPSE and co-wrote MEGADETH's bio from bass player David Ellefson.